With spring cleaning far behind, and summer fun all but over, it’s time to start fall home maintenance. 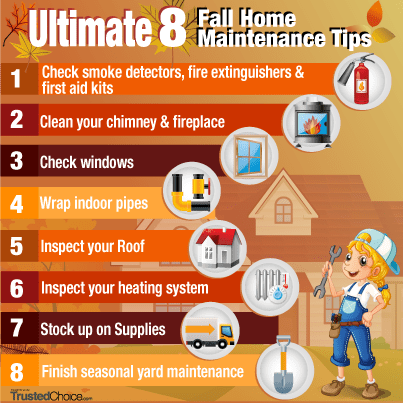 We have compiled the top eight fall home maintenance tips, along with what you can do to ensure your home stays warm and comfortable this winter. 1. It’s important to inspect your heating to ensure it functions all winter long. 2. Chimneys and fireplaces cause some of the most expensive damage to homes. Make sure to leave your flu closed when not in use, and always have a fireplace screen in front of open flames to protect your home from wayward sparks. 3. Windows may be a continual source of frustration for homeowners. There are many seal repair kits available at local hardware stores. 4. Every six months, replace batteries in all the detectors in your home. 5. Winterizing pipes is one of the easiest, most valuable ways to protect your home over the winter. Most home repair stores carry fitted insulation that can easily wrap around any size pipe. 6. Fall leaves may be beautiful, but these can slowly rot, causing huge backup and damage in gutters. 7. A roof inspection may seem overkill, but harsh winter winds and heavy snow can take a toll on your home. 8. Before prices on winter gear soars, stock up on winter items such as snow shovels, firewood, or sidewalk salt. It’s better to have the supplies now than to have to run to the store during a snowstorm! For many of us, our homes are one of our most important assets. A home serves as a long-term investment, but is also the place that provides shelter for your family. It is important to take good care of your home. 1. 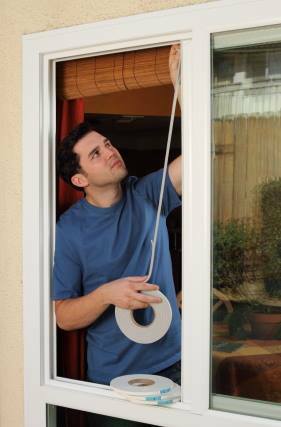 Check windows, exterior doors, and skylights to make sure they are closed tightly; repair or replace weather stripping if necessary. 3. Drain and store outdoor hoses. Close the interior valves to the outdoor connection; this ensures the valves won’t freeze during the cold months. Now, share with us a few of your tips!